Excitement is rife in Sihanoukville as a new species of Nudibranch was discovered in the waters off Southern Cambodia. Marine Conservation Cambodia, Project Abroad’s conservation partners in Cambodia, have spent the last few years working to try and identify the many endangered species on this side of the Gulf of Thailand in an effort to create areas of protected reef and safeguard habitats being destroyed by illegal fishing. 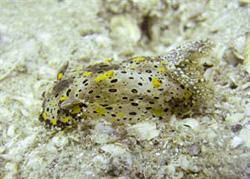 Now we have hit the headlines of the Wall Street Journal and Sport Diver magazine with the unidentified Nudibranch. Nudibranchs, from the family Opisthobranchia, are the most conspicuous of the Molluscs. Popular amongst divers for their bright colors, these sea slugs can occasionally grow over a foot in length, though are more normally only a couple of inches long. They have a pair of antenna on their head and external gills which seem to wave merrily in the currents. In Cambodia alone, over 60 separate types of Nudibranch have been identified with many more still to be recognized. Cambodia is often considered a bit of a poor relative in diving terms when compared to the more popular Thailand, but there is a fantastic diversity on all of the reefs, so much so that people are still not really sure what is actually there. One of the main projects Marine Conservation Cambodia and Projects Abroad are working on is trying to catalogue the life that is here, before it is wiped out. It was on a normal survey dive to Koh Rung, just north of the island where the project is based, that Paul Ferber, our Conservation Manager found and photographed this beautiful new species. After many hours of painstaking searches through books of Nudibranch pictures, the team admitted defeat in identifying the small slug-like invertebrate and sent the picture to internationally-acclaimed Naturalist Neville Coleman. He described it as unidentified, saying “I’ve never seen anything like it”. 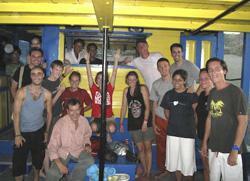 The project team are ecstatic and waiting for final confirmation and hopefully a classification on the Nudibranch. You never know, they may even call it Pleurobranchus Ferber!